While Hitachi's products are renowned for their ease of installation, programming and use, there is no such thing as "plug and play" in the drives and controls field. It is absolutely imperative therefore to offer the highest level of technical support. 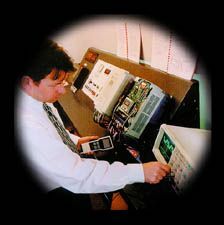 HID provides that support by telephone and on site, where necessary. In fact HID goes to extraordinary lengths in support of the customer, including late night and weekend site visits when downtime is critical. HID knows that in many control applications, downtime is not an option. Users can call HID at any time in normal working hours and get an amazingly fast response to their queries. Whether it is relatively simple procedural guidance that is needed, or a complicated programming or application headache, customers can be assured that the combined talents of HID's technical team will be brought to bear on the matter immediately. Where new applications are encountered, HID emulates the technical requirements of the application in its test laboratory to ensure correct product specification and configuration before shipment to the customer. If necessary, testing is also carried out at the customer's site before commissioning the actual products to be used. In short, HID goes to every length to ensure the Hitachi products meet the technical requirements of any application - on time and right first time. In addition to the above, HID provides a full maintenance and repair service which delivers products back to the customer as good as new and with a full warranty covering the work completed. Again, knowing that control products are usually needed in a hurry, HID's turnaround times on service and repairs are as short as possible. In some instances, replacement products can be loaned to customers to overcome short term problems.